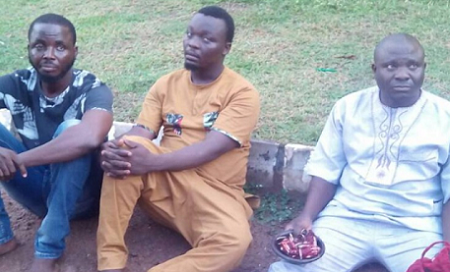 Three self-acclaimed Islamic clerics, have bee arrested by the Ogun state police command for possession of human parts, alleged rituals, and murder. Commissioner of police Ahmed Ilyasu, parading the suspects Adebayo Mudashiru (36), Raheed Abass (33) and Rasaq Adenekan (42) at the Federal Special Anti-Robbery Squad, SARS, headquarters in Abeokuta said they were arrested with both dried and fresh human parts on October 5. He added that a human skull, reptiles and assorted charms were also found on them. Speaking further with newsmen, Ilyasu said interrogation revealed that the suspects were serial killers, with their operational office located at number 6 Baase compound, Totoro, Abeokuta.